The vaults of the dead lie scattered across the Inner Sea region, waiting for the intrepid and the foolhardy alike to explore them in search of treasures and secrets lost to the ages. From labyrinthine gilded catacombs to the submerged ruins of a forgotten nation or an arcane tower hewn from crystal, these monuments to the deceased are as filled with history and riches as they are cursed with peril and despair. 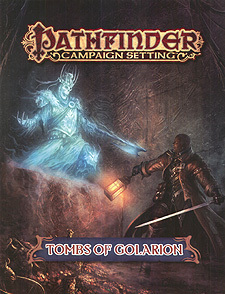 Those daring enough to brave these tombs' traps and monsters will find themselves wealthy beyond measure - or entombed with the dead for all eternity! The Prismatic Lantern, an arcane siege engine powered by a self-contained demiplane, which holds the final resting place of the weapon's creator.